The Lathem 5000EPlus is a multi-purpose time recorder designed to handle all of your business's essential time recording needs. 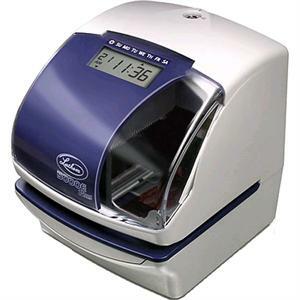 As a time clock, the 5000EPlus prints the time and date on cards or job tickets for calculating payroll or costing jobs. The 5000EPlus unit can also be configured to append comments such as paid and sent to the time and date, making it an ideal choice for stamping important documents. And if your application requires the unique identification of documents, the 5000EPlus can even be set to operate as a numbering machine, printing up to an eight-digit number that advaces based on your settings. Selectable automatic or manual print activation. Perpetual calendar until the Year 2089 changes year, month and date automatically. Wall or desk top mounting for easy access. Optional NiCd full 24-hour operational battery backup (up to 200 punches). Optional Signal Relay can be added for programmable circuit closure for sounding a bell or horn.